Joe Lauer, Carrie Laboski, Francisco Arriaga, and I will be presenting at an Extension event on August 5th. 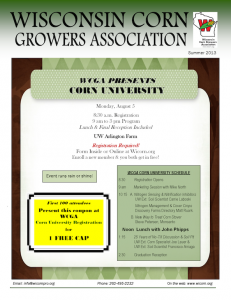 This “Corn University” will cover topics of nitrogen, soil, and agronomic management of modern corn production. I will be presenting on nitrogen management of corn (including controlled-release fertilizers and crop rotations) and cover crop management. Click here for more details.